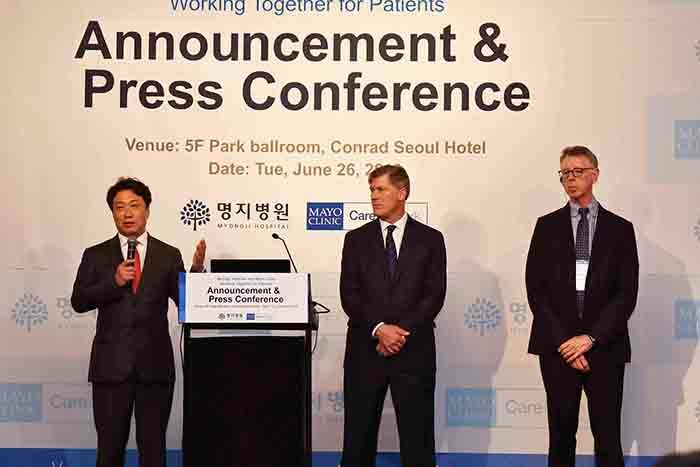 From left, Myongji Hospital CEO and Chairman Lee Wang-jun, Mayo Clinic Vice President Wyatt Decker and MCCN Medical Director David Hayes attend a joint news conference at Conrad Seoul Hotel on Tuesday. Myongji Hospital’s joining the Mayo Clinic Care Network (MCCN) early this week has opened a new horizon for Koreans seeking excellent healthcare service without leaving the country, medical experts here agree. With the accord, Korean patients can receive, directly and indirectly, medical care from the Mayo Clinic, a world-renowned institution in the United States. Korea Biomedical Review met with Myongji Hospital CEO and Chairman Lee Wang-jun, MCCN Medical Director David Hayes and Mayo Clinic Vice President Wyatt Decker after the signing ceremony on Tuesday, to obtain in-depth information about the agreement. Decker: The Mayo Clinic Care Network, launched in 2011, is the collection of independent medical institutions selected by the Mayo Clinic after undergoing a rigorous validation process to allow the exclusive use of Mayo's knowledge, expertise and resources. The MCCN consists of more than 40 member organizations in the U.S., China, Mexico, Philippines, Saudi Arabia, Singapore and the United Arab Emirates. While remaining independent, the members share a common goal to improve the delivery of healthcare. KBR: Why did you choose Myongji as a member of MCCN in Korea? Hayes: Many medical centers talk about innovation, teamwork, physician leadership and the need for patient-focused but few practice them. During our rigorous validation process, we were impressed that Myongji acted to withhold its value and vision. Also, we saw that Myongji’s core value of putting the needs of the patients above all else matched our vision. Lee: A hospital cannot just decide to join the MCCN even if they have the funds needed to join the network. All hospitals have to go through thorough screening and can join the group only if they pass such process. KBR: Would you be choosing any more hospital in Korea to join MCCN? Hayes: It is possible. We choose MCCN partner hospitals based on their areas of expertise. However, even if we decide to partner with another hospital in Korea, we would have to go Myongji Hospital first before we make any decisions. KBR: What kind of care can a patient expect from this agreement? Hayes: There are various ways a patient can benefit from this agreement. Patients, for example, can get help from the Mayo Clinic's knowledge and expertise through Myongji Hospital's doctor at any time without any additional cost. Also, any patient who wants a second opinion on a diagnosis from Myongji Hospital can do so without leaving the hospital. KBR: Can a Korean patient receive treatment at Mayo Clinic if they want? Hayes: Yes. We are willing to provide treatment at one of our three hospitals. However, this will only happen when both the patient and Myongji doctors agree that the benefit of the patient traveling to the U.S. is in his or her best option. KBR: What will be done to protect the patient’s medical information? Hayes: We follow all U.S. regulations regarding information security. Also, all data transferred to the Mayo Clinic will have to go through our state of the art firewall, which is one of the best in the U.S.
KBR: What can MCCN provide to Myongji? Decker: We started to notice a pattern a few years back of large hospitals acquiring small hospitals. Although the Mayo Clinic also considered making mergers and acquisitions deals, we believed that sharing and learning knowledge in equal relationships will be more beneficial to medical advancement. We plan to provide Myongji with medical and administrative consultation, and also expect to benefit from Myongji Hospital’s excellent research on cancer and regenerative medicine. KBR: Korean hospitals also have various cooperation agreements. What’s the difference between them and this agreement with MCCN? Lee: Although local hospitals engage in collaboration, most of them only provide patient referral and follow-up results. However, the relationship between Myongji Hospital and Mayo Clinic is more substantial. The agreement includes diagnosis, and treatment, as well as requesting medical care from the Mayo Clinic if the patients so desire. Our employees can also access and use Mayo Clinic’s education materials. The most significant advantage is that even with these advanced services, there is no additional cost to the patient. KBR: Mayo Clinic is one of the largest institutions for clinical trials. Can Korean patients also participate in Mayo’s clinical trial? Hayes: It is possible. However, due to the different regulations in each country, it is necessary to resolve these issues first. KBR: Does the MCCN also introduce one of its member institutions to another? Hayes: Yes. We foster cooperation between our members if necessary. If an MCCN member requests to be introduced to another member, they can do so by asking us. We also regularly hold events where all CEOs and presidents at our member hospitals get together.